It is amazing that how such a simple chocolate cake recipe, can be so incredibly toothsome. You must try out this heavenly chocolate almond cake recipe, for it just melts in your mouth. A dark chocolate cake which will persuade you to commit the sin of falling into temptation. Believe me, you will not stop at having just a small slice, you will have another and another....and yet another...till you can hear your stomach shouting at you, "enough, no more please! ", your conscience pricking you, constantly in your ears, "how will you ever justify these calories?" and yet your mouth coaxing you, "go on, take another piece, everything else can wait". This is really one of the best chocolate cake recipe. Dark chocolate cake with chocolate inside it and an amazing chocolate icing outside it. This simple chocolate cake recipe is very rich, full of calories but heavenly tasting cake, ideal for special occasions like a loved one's birthday. This cake will be the ultimate romantic surprise for your valentine on valentine's day. If you want to impress your boyfriend or girlfriend on a special date, by cooking yourself, this cake will definitely fetch you points. So without further ado, here's how you can make a simple chocolate cake recipe. * 2-3 Tbsp of white chocolate shaving or melted white chocolate. Line a cake tin (use any shape but a ring is what I use for this cake mostly. You can use a 7 inch round or square tin as well). Sift the flour and baking powder and keep aside. Put the chocolate (under the cake ingredients) in a glass or any heat proof bowl. Add the butter and water. Place this bowl on a pot of already simmering water, so that the bowl doesn’t directly touch the water, but is placed on the rim of the pot. This is way to melt the chocolate on a double boiler, so that in doesn’t burn. Keep string it with a spatula till it melts and all the ingredient in the bowl mix well. Keep aside to cool. Beat the castor sugar and the egg yolks, till light and fluffy, with an electric beater. Now mix the melted chocolate and mix again, until well combined. Carefully fold the ground almonds and flour, using a rubber spatula. Now beat the egg whites until they form soft peaks and add them to the cake mix. Again very gently fold them in. Pour the mixture into the tin and bake in a preheated oven at 180° C for 45 minutes. It should be springy to touch when done. Always do a skewer test. 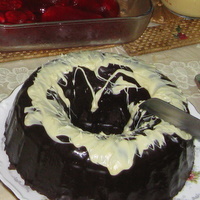 Insert a skewer or knife in the centre of the cake and pull out. If it comes clean, your cake is done. After 5 minutes, carefully tip over the cake on a cooling rack and let it cool completely. Place the cake on the serving tray and insert strips of baking parchment under all sides, tucking it at least an inch under the cake and at least 2 inches outside. This way your serving tray will not get spoiled with chocolate stains and you can easily pull out the baking paper from underneath the cake when the icing is set, without disturbing the cake. Melt the chocolate with milk in a microwave or double boiler. If using a microwave, put on high for 15 seconds and then take out mix around with a spoon and keep again for 15 seconds, repeat. Do not, I repeat, please do not put it in a microwave for 1 minute at a stretch as that might burn the chocolate. When the milk and chocolate has melted well. Take it out and carefully add all the icing sugar and mix well. It should be a thick flowing consistency, if too thick, add a table spoon of hot milk in it and mix again. Now pour this on top of the cake. The icing will trickle down, use a spatula to lift the icing from the baking parchment and put it back on the cake. When the whole cake is covered, keep it in the refrigerator. After 30 minutes the icing would have set completely. Remove the baking paper from underneath the cake. Put some white chocolate shavings on top of the cake or just pour some melted white chocolate on top to form an abstract design. You can even put some white melted chocolate in a small piping bag and make a design on the cake. Serve at room temperature. Enjoy your simple chocolate cake recipe! Kindly note :- There will be no need to refrigerate the cake after icing in colder regions. It is always suggested by professional chef's to place the cake on a wire rack before doing such an icing. So that the extra chocolate just trickles down through the wire rack. That way your cake comes out very neat. But I feel that if you are making a cake at home, you should not waste the chocolate icing, therefore I use the baking paper technique for icing.